Over a Century of Effective Legal Solutions. 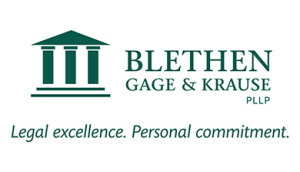 Mankato law firm Blethen Gage & Krause is one of the area’s oldest, most respected law firms. Since 1896, Blethen Gage & Krause has provided high-quality legal services to clients small and large. From Ag, Business and Criminal Law to Personal Injury, Family Law, Estate Planning and more, the lawyers of Blethen Gage & Krause are committed to providing quality legal representation to clients throughout Greater Mankato and beyond.